Canadian Red Cherry Single This tree is an ‘Idaho Preferred’ Plant. Canada Red Cherry tree is a very vigorous grower. It has a straight trunk and with well rounded branch structure. 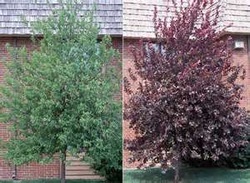 The color of the foliage begins in springfirst appearing green, then turning dark purplish-red as the season progresses. The blooms are very fragrant. It also produces small fruit good for making jams, jelly, sauces and wine. Canada Red Cherry trees attracts wildlife and birds who will eat the fruit. Flowers attract bees in the spring. Use Prune Smart on any suckers. Will preform best when planted in full sun.